Bull City Mutterings: Do Tax Cuts Generate Growth? Do Tax Cuts Generate Growth? There are some really smart people who run for President of the United States of America and many who may be even smarter serving as advisors to these candidates. One of them, Mitt Romney, who was a richer if not also smarter classmate of mine at Brigham Young University during the 1970s, is promising to cut taxes even further as a means to quicken economic growth. 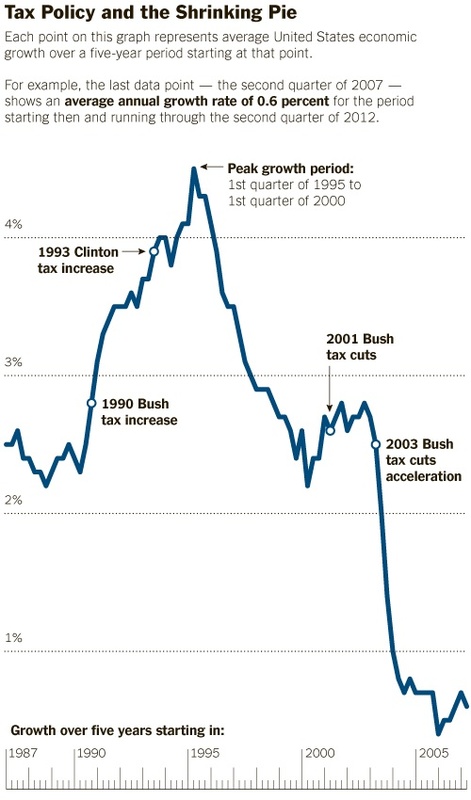 To moderate Independents such as me that may sound reasonable, in the same sense that any stimulus is also reasonable, until you look at the result of past tax cuts as illustrated in the chart in this blog which appeared last month in a New York Times piece by David Leonhardt. Looking at the period covered by the terms of our previous four presidents, it turns out that when taxes were increased during the George H.W. Bush and Bill Clinton administrations growth occurred – indicating that their tax increases actually generated or were not adverse to economic growth. The complete opposite happened, when in the both the early and mid 2000s, George W. Bush cut taxes. Of course it is more complicated than that and anyone interested or swayed one way or another to base his/her vote on this issue alone would be well advised to read Leonhardt’s piece. One reason tax cuts have so little, if any, impact is that tax rates are are currently so low. Tax cuts also don’t make much sense at a time when our most important priorities are to make significant reinvestments into aging infrastructure, research and development to achieve energy independence and to restore strategies to generate social mobility and pay down the deficit. Any tax priority now seems better aimed at revising the code and eliminating loopholes and especially favors carved out by rent-seeking groups that rather than create value-added to the economy seek to use lobbying and campaign donations to rig the system in their favor. As for the so-called 47% who Romney claims don’t pay federal income taxes, which is more like 1%, it appears to me from recent analysis that they disproportionately live in red-states and that the proportion has tended to increase during my lifetime mostly during Republican administrations. There has to be more to the fact that so much analysis reveals that states dominated by factions who seem to despise government and taxes the most, including reforms such as those being made to healthcare, are the same states where residents take far more than they give in terms of federal benefits, who are more obese and drive up healthcare costs, scam Medicaid while going to college and have higher teenage pregnancy and the worst credit. Maybe some of this can be chalked up to “inversed projection,” a condition where individuals or groups subconsciously rationalize a contradiction by painting themselves as the victim instead. But just maybe, across the political spectrum, we all need to be a little less impious and spend more time looking into the mirror than down our finger. Humility in a candidate may be the attribute that most swings my vote in this election.